Upon arriving at the entrance of this residence, you are met with the unsightly view of electrical controls of the next-door neighbor’s gate. On the opposite side of the driveway, a woodland, although promising, was filled with briars and poison ivy. In the shaded front-yard bed, sun-loving plants had died and those left were not thriving in soil that had become worn and thin. 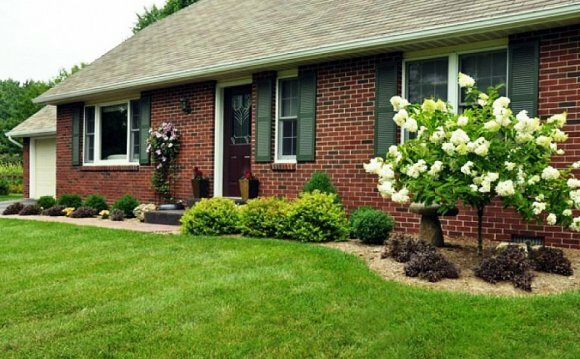 The owners want a design using shade-loving plants to give a fresh look to a shade bed in the front yard. They craved a woodland wildflower walk that would provide nectar for the bees they keep. And they had to do SOMETHING about the neighbor’s exposed electrical controls at their entrance. To mask the next-door neighbor’s electrical controls, five Ilex x ‘Nellie R. Stevens’ (zones 6-9) were planted to form an effective hedge, flanked on each end by Illicium floridanum, (zones 6-9). On both ends of the hedge, curving toward the driveway, drifts of six red stemmed dogwood, Cornus sericea ‘Arctic Fire’ (zones 2-7), were planted for winter interest. To provide color during the summer and to provide nectar for bees, five butterfly bushes (Buddleia davidii ‘Black Knight’ zones 5-9) were spaced five feet apart, in front of the holly hedge. For foliage color, a skirt of 13 Abelia ‘Kaleidoscope’ (zones 5-9), a compact variegated shrub whose colors change through the seasons, completed the bee-friendly planting. Now guests feel welcomed when entering this landscape. Tucked back 25’ from the path, Cornus kousa (zones 5-8) and Cornus florida (zones 6-9) dogwoods have been staggered along its length for texture and color. Shrubs that will tolerate some shade — like oak leaf hydrangea (Hydrangea quercifolia zones 5-9), willowleaf cotoneaster (Cotoneaster salicifolius zones 6-7), leatherleaf mahonia (Mahonia bealii zones 4-8), and various rhodendron cultivars(zones 4-8) — have been planted in drifts of five to seven along the path. To provide color and nectar for bees through the spring and summer, drifts of 21 different wildflowers and perennials will be planted along the path in pockets of shade or sun, moist or dry soil, as appropriate, including: Black Cohosh (Actea racemosa zones 3-8); Butterfly Weed (Asclepias tuberosa zones 3-9); Swamp Milkweed (Asclepias incarnata zones 3-6); Fleabane daisy (Erigeron pulchellus zones 3-10); Geranium ‘Roseanne’ (zones 5-8); Columbine (Aquilegia canadensis zones 3-8); purple coneflower (Echinacea purpurea zones 3-8); Joe Pye Weed (Eupatorium fistulosum zones 3-9); gray headed coneflower (Ratibida pinnata zones 3-8); foamflower (Tiarella cordifolia zones 4-9); dwarf iris (Iris cristata zones 3-9); cardinal flower (Lobelia cardinalis zones 3-9); Blue Cardinal Flower (Lobelia siphilitica zones 4-9); Black & Blue salvia (Salvia guaranitica ‘Black & Blue’ zones 8-10); Heliopsis ‘Golden Glow’ zones 3-9; Cabbage leaf rudbeckia (Rudbeckia maxima zones 4-9); Amsonia zones 4-9; Indian Pink (Spigelia marilandica zones 5-9); Virginia bluebells (Mertensia virginica zones 3-8); Beard’s Tongue (Penstemon tenuifolius and Penstemon laevigatus zones 3-8); white wood aster (Aster longifolius zones 3-10 ); and blue wood phlox (Phlox divaricata zones 3-8). These plants were chosen for bee-friendliness and beauty. From spring to fall, there will be color along this woodland walk.